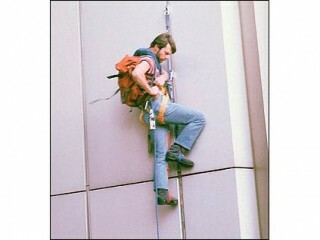 George Willig is a mountain-climber from Queens, New York, United States, who climbed the South Tower (2 WTC) of the World Trade Center on 26 May 1977, about 2½ years after tightrope walker Phillippe Petit walked between the tops of the two towers. Using special tools and accompanied on the ground by his brother Steve, Jery Hewitt and photographer Michael Cardacino, Willig began his illegal ascent around 6:30 on a Thursday morning. Near the 55th or 66th floor (reports vary), he was approached by police on scaffolding, but they allowed him to proceed to the top on his own. When he reached the 110th floor around 10:00 a.m., he was arrested and charged with trespassing. The Port Authority announced they would sue him, but it became clear that Willig, dubbed the "Human Fly" by the Daily News, had achieved national attention as a New York folk hero. A settlement was reached for public relations purposes, and Willig was fined one penny for each floor of the tower he climbed, a total of $1.10. By all accounts shy of the limelight, he nonetheless made the rounds on TV shows and in magazines, but left it all behind after a couple of years -- for life in California in the construction business. Willig signed his name on a chunk of metal at the top observation deck, and it was still visible until the building was destroyed on 11 September 2001. View the full website biography of George Willig.